Satish Chandra Dubey faces charges including murder, attempted murder, rioting armed with a deadly weapon, robbery, theft and killing or maiming cattle, to name but a few. Mr. Dubey, who is also suspected of involvement in drug smuggling and has previously been charged in a bank robbery, is one of several criminals-turned-politicians in India. He is known as a “bahubali,” or a powerful person. On Friday, Mr. Dubey was also elected as a member for the state of Bihar in India’s 16th Lok Sabha, or lower house of Parliament. He is one of the 112 newly elected parliamentarians, more than a fifth of the house, who have declared serious criminal cases registered against them. An analysis of the members of the newly elected lower house of Parliament shows that it is not only increasingly criminal, but also increasingly unrepresentative of the population it serves, with regard to wealth, age and religion. The tiny silver lining is a slight increase in the number of women in the ranks of lawmakers. About a third, or 34 percent, of the elected members have criminal records, up from 30 percent in 2009 and 24 percent in 2004. And the percentage of members of Parliament like Mr. Dubey, who face serious charges, is up to more than 20 percent from 15 percent in the previous election, despite recent changes that were designed to dissuade parties from fielding criminal candidates, according to a study by the Association for Democratic Reforms, which analyzed the affidavits filed to the Election Commission as part of the candidates’ nomination papers. Civil society organizations have argued for raising voter awareness of the criminal records of electoral candidates. Some say, however, that voters are aware of the criminal antecedents of local politicians but see them as benefactors who are working to serve the needs of their constituents through both fair and foul means. “Though in the eyes of the law they may be criminals, several political candidates with serious criminal charges against them have a Robin Hood image in the constituency,” said Sanjay Kumar, a political analyst and director at the Centre for the Study of Developing Societies, a research institute in North Delhi. He said that lawmakers who are guilty of crimes, particularly those seen as being against corrupt public officials, are often popular. “They may protest the administrative machinery and thereby break the law, but they are seen as local heroes who are trying to help poor people by different means,” Mr. Kumar said. Data collected by the Association for Democratic Reforms show that the likelihood of a candidate with a criminal record winning is 13 percent, whereas the likelihood of a candidate with a clean record winning is 5 percent. The members of Parliament are also wealthier than last time round. As campaigning in India becomes increasingly costly, with candidates holding huge rallies and spending more than ever on media coverage, the winners of the latest parliamentary elections are the richest ever. About 82 percent of the new members of Parliament have assets over 10 million rupees, or more than $170,000, compared to 58 percent in 2009 and 30 percent in 2004, according to data collected by the Association for Democratic Reforms. A candidate with more than 10 million rupees was 10 times more likely to win than a candidate with fewer assets. “With parties stretched thin and declining organizational capacity in many parties, party leaders are more and more reliant on candidates who can pay their own way,” said Milan Vaishnav, an analyst at the Carnegie Endowment for International Peace, a Washington-based research center. Even as nearly two-thirds of Indians are under 35 years old and half are under 25, an increasing number of elected politicians are 55 or older. 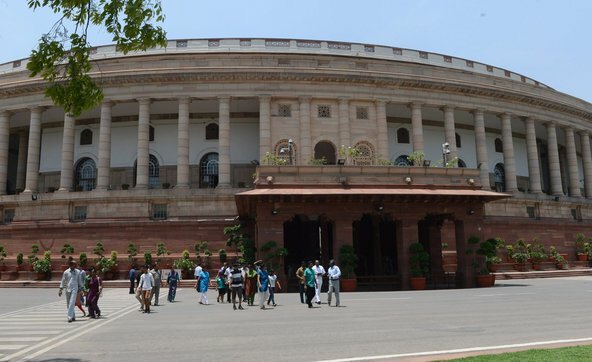 This Parliament will have the highest ever number of members over the age of 55, making up almost half of the lower house of Parliament, according to data compiled by PRS Legislative Research, a Delhi-based organization working to improve the legislative process. In the first Lok Sabha in 1952, 80 percent of the elected parliamentarians were under the age of 55. According to Mr. Vaishnav, the age and wealth trends are not unrelated. “When it comes to a young, grass-roots leader moving upwards within the party, there are relatively few opportunities for those who are not dynasts or who don’t have deep pockets,” he said. And while the Muslim population in India is growing, Muslims have fewer representatives than ever in Parliament. While Muslims now make up about 15 percent of India’s population, they only make up 4 percent of Parliament, according to an analysis carried out by The Hindu, an Indian newspaper, which said that the 22 Muslim members of Parliament were the fewest in 50 years. While the population of Uttar Pradesh is about 20 percent Muslim, no Muslim parliamentarians were elected from the state, which was all but swept by the Hindu nationalist Bharatiya Janata Party. The one area in which the demographics of the Lok Sabha have shown some limited improvement in terms of reflecting the population is in its gender ratio, with the highest ever number of women elected, according to PRS Legislative Research. However, while women make up 49 percent of India’s population, they still only constitute 11.3 percent of Parliament, a small improvement from 2009. In 2009, 58 women were elected to Parliament; this year, there were 61. Though Indian women are voting in greater numbers than ever before, political representation has been consistently low, and bills to ensure that a third of Parliament is reserved for women have been stalled in the Lok Sabha since 1996. The slight increase comes with a caveat: Those women who do enter politics are often the wives or daughters of politicians. Some political leaders have argued that they choose candidates based on their ability to win and not on their gender or religion. Trilochan Sastry, the founder of the Association for Democratic Reforms, said that the fault lay with the parties. “Political parties can definitely put up younger, more capable, honest candidates and they will still win,” he said.